The Brunswick Rotary Club Patriot’s Day Half-K guarantees a stress-free experience and a poke at more serious runners. 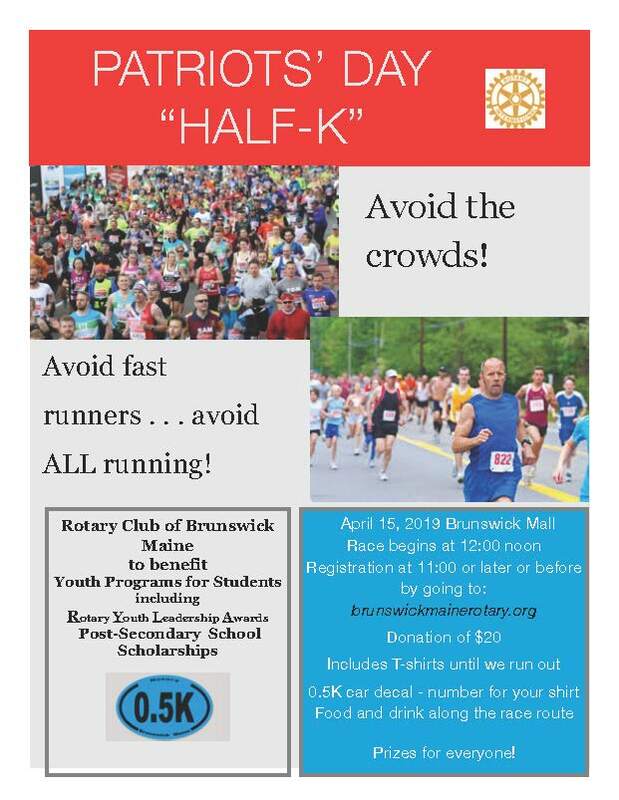 Raising money for the Brunswick Rotary Club Community Fund, the Patriot’s Day Half-K is a lampoon of the typical 5K run. Branded as an event for underachievers, the race will take runners on a beautiful 546-yard route next to or on the scenic Brunswick Mall. The best parts of a road race will be maintained with t-shirts and “0.5K” car decal. Water stops will be expanded to include coffee, donuts, pizza and other goodies. Your shirt number will serve as a raffle ticket for prizes. All participants will be winners as they support the many youth programs served by the Brunswick Rotary Club. To ensure your place in the Patriots' Day Half-K, and to guarantee a t-shirt, you may register here. A donation of $20 will be appreciated on April 15th at the race site.